It’s quite a mouthful, that title, but there you have it. I’ve rekindled my interest in these models, God alone knows how I did it, and I’ve finally painted up another model for this project. 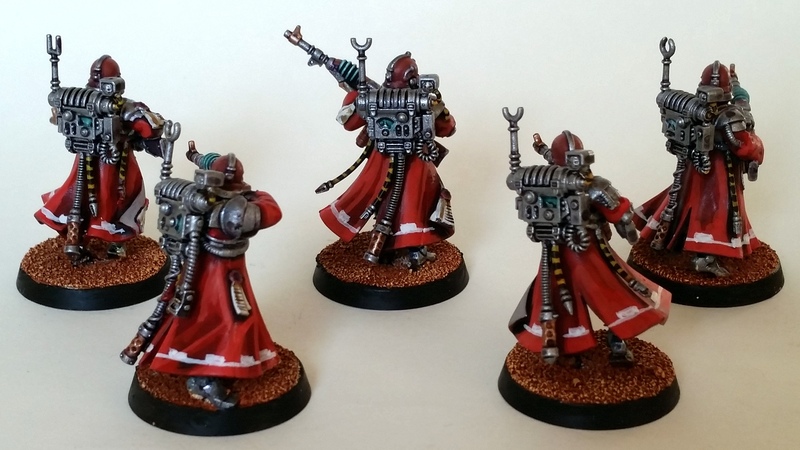 Even though I initially opted for a Skitarii army I’ve been looking at the Cult Mechanicus models as well. 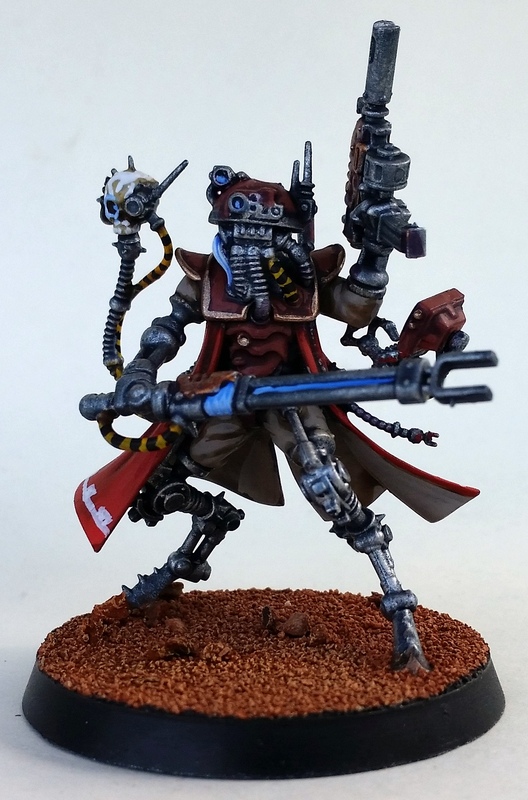 I’ve always found that an army needs a commander model, and as Skitarii have nothing of the sort I’ve gone for this chap here. I’ve painted him up with the same processes as on the previous models, starting out with a silver undercoat spray from Army Painter. The red robes and the terracotta armour plates were washed with purple before being layer highlighted – it was painstaking to paint some of the areas because of the buildup of the model. And I hate subassemblies. One area I have never been good in is painting translucent objects, such as the fluid tanks on the back of this model. I’m only partly satisfied with this, not just with the technique but also with the choice of colour. I’ll leave it this way, though; can’t be arsed to start over again. That’s that! I still have a long way to go before I can play any sort of representative game with these guys, so I’m slowly continuing on. 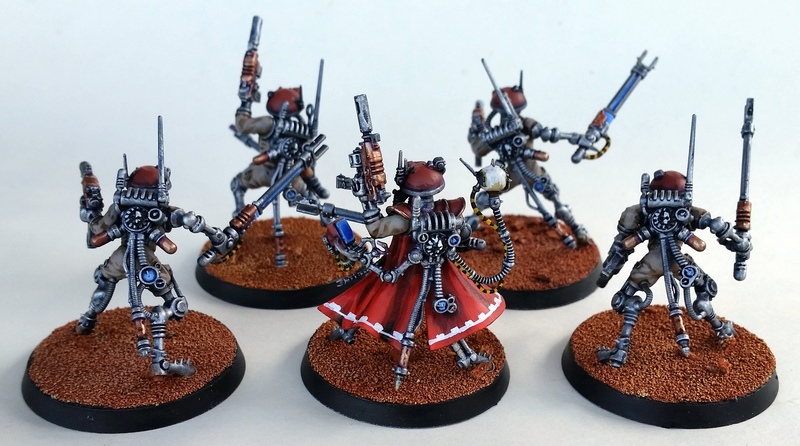 Next up are a few more Skitarii Vanguard to round that unit out. Not sure when they’ll be finished though – I have lots of other things I want to get off the desk first. Thanks for reading! These guys were completed a while ago but only now photographed – I’ve been quite busy with other stuff! Let’s go straight to the models themselves, shall we? Models by Games Workshop, of course. 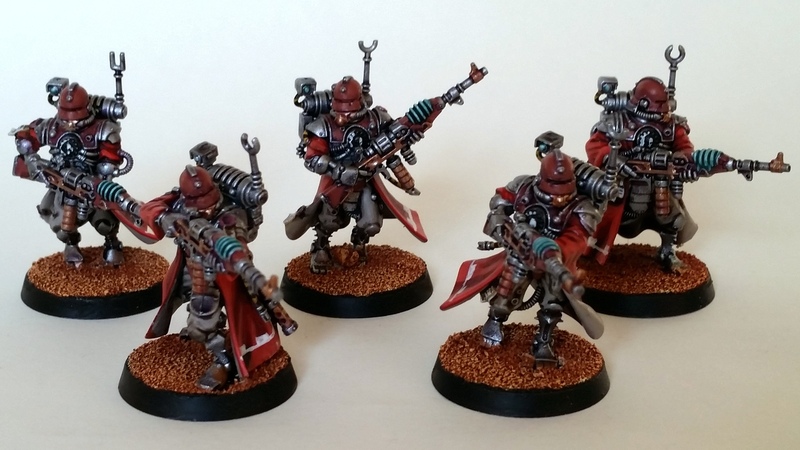 I figured I’d want to have one squad each of these troops, so I actually split my one Skitarii box – which is my June purchase together with a set of data cards – right down the middle and built five each of regular troops. No special weapons yet. 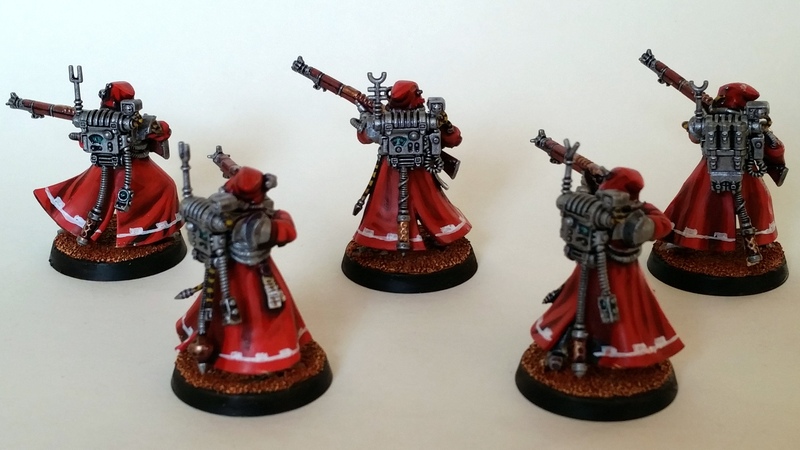 The robes were very time consuming to paint. These guys were a hassle to build, as you can’t mix and match torsos to legs; you really have to take care to fit them together in the right order. That said, this method reduces the chance of wonky poses which the older plastic sets were infamous for. More beginner-friendly, let’s say? I painted these up in exactly the same fashion as the first unit of Infiltrators, starting off from an AP plate mail undercoat. The ubiquitous robes did however increase the time it took dramatically. Still worthwhile, though. The little yellow-black cabling helps fill out the palette. One notable divergence from the painting scheme is that I swapped out guilliman blue for coelia greenshade on the glowy bits such as the Vanguards’ rifles. I wasn’t too happy with how the former came out on the Infiltrators, so I’m going to revisit them soonish. Anyway, that’s it for this month’s 40k update. July will either feature more Skitarii, or perhaps a vehicle, who knows? I’ll be moving house in August and I first have a couple of vacations for my wallet to survive, so I’m not exactly sure about buying the more expensive GW toys at the moment. At any rate, I hope you enjoyed the blog post, and for the historical purists: There’s another blog update due tomorrow, which will feature a certain feline duo my Germans have just welcomed into the family. Auf wiedersehen! Continuing the ahistorical trend on the blog, here’s another shocker for you today. For the first time in many years I’ve purchased a Games Workshop article that’s not paint or tufts. Crazy, I know! For the historically minded readers out there: Don’t worry, I haven’t gone back to my roots completely and I’ll have some more Late Romans and the like for you very soon. But let’s continue with these new toys first, shall we? To the credit of GW’s design team, they’ve finally released an army that has rekindled my interest in their side of the hobby – also called ‘the Games Workshop hobby’ – and to me it really is a step in the right direction. It’s a low model count army, with these Infiltrators clocking in at about 200 points when upgraded. Perfect. The back of the cloak with the freehanded cog pattern. The kit comes with two options, of either Infiltrators, the ones I chose, or Ruststalkers which are close-combat specialists. I’ve always liked shooty armies so I’ve gone with the Infiltrators, with the added bonuses of them being more expensive points-wise and having nifty special rules. I’ve given them the flechette blasters instead of the stubcarbines, as I like how the former look; a bit like silenced machinepistols. Paintingwise there isn’t much work involved with these models – I went for a silver spray undercoat from AP, washed with drakenhof nightshade and drybrushed necron compound, and then added in the different details. The armour plates are tuskgor fur with a purple wash and then tuskgor fur reapplied as a highlight, the red is the usual progression of tones, etc. The one thing I’m not sure about is the blue which is white with a guilliman blue glaze. I might experiment with that a bit further. I’ll be adding piecemeal to this army at one item a month. 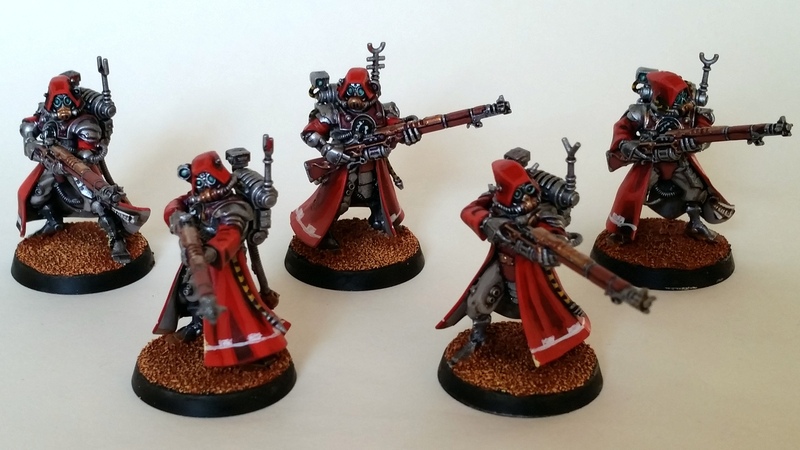 These models were purchased in April, May’s item is the rulebook, so it’ll be June before you’ll see the next unit – probably some Skitarii. I hope you enjoyed the blog post and check back soon! These guys took me a lot more time than I’d thought, so I’ll be brief with them. I made the mistake of undercoating these red in anticipation of a red-heavy palette and then switching to something entirely different afterwards, so that wasn’t a lot of fun – some coverage issues with the blue. The models do have some impressive detail for being plastics, but it’s a shame that there’s only three different sculpts in the box. I think these might be the most colourful models I’ve done in a long while, and I think it suits them well. It’s not exactly flattering if you get a closeup of them, but that’s usually the case with my layer highlights. Last Saturday at Warcon 27, our local annual wargames convention, one of our club suddenly erupted in triumph as he made his way from the traders to our demo table (also known as “that table underneath which we stuff our manifold purchases”). He’d apparently received a great deal on a Dreadball starter set plus two extra teams for the game. I’d heard rumours about this game being an improved version of the venerable Bloodbowl, and with our Thursday evening club nights stuck in a bit of a rut, I thought I’d hop on the newly-launched band wagon. 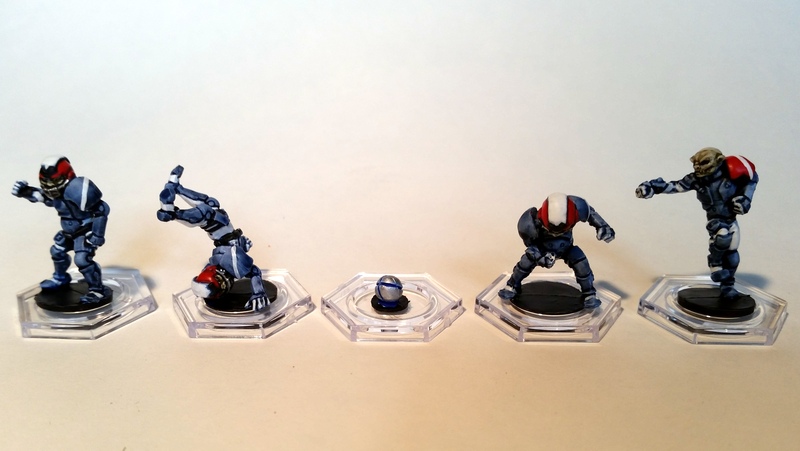 However, my own team will be handled later, as I’ve first painted up Kurt’s Hobgoblin team. Let’s take a look. These are the first Mantic models I’ve done, and I have to say I really like them. They’re advertised as ‘sprueless plastic’ which is great, as they’ve got the standard flash and mould lines of plastic models but without needing assembly. Detail is about average for plastic models, although the big guy in the next picture could’ve used some more. The big guy is my personal favourite. I painted these over a white undercoat, with washes of guilliman blue and drakenhof nightshade on every part of the models apart from the skin, which was washed twice with athonian camoshade. 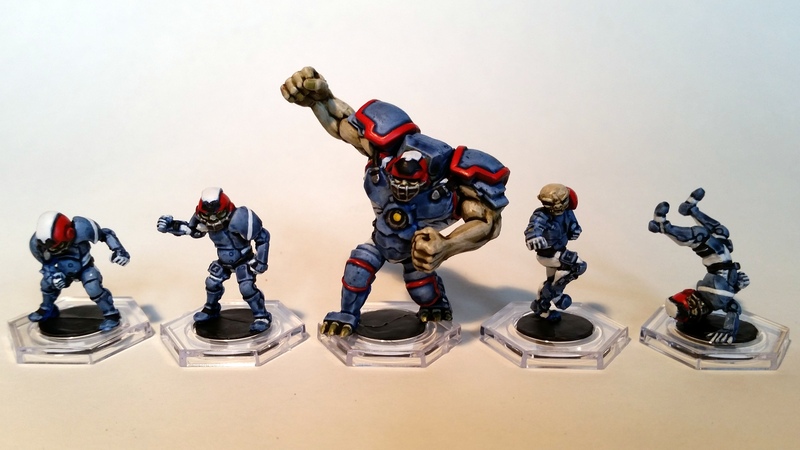 The undersuits were then painted white using the underlying dark blue for shading. The red was basecoated khorne red then highlighted evil sunz scarlet, and the skin was given a bleached bone highlight. Black for straps and silver for small metal bits, and done. My own team will be dealt with soon, so check back!